The Leica RM2165 is a highly adjustable and reliable biomedical research rotary microtome. This automated microtome can be operated either fully motorized or hand driven, at a section thickness setting from 0.25- 60 um, with a vertical stoke of 70µm. This rotary microtome further breaks down ranges into coarse and fine ranges, from 0,25 µm, 0,5 µm, 1 µm, 1,5 µm, and in increments of 1 µm from 2 -20 µm and increments of 5 µm from 20-60 µm. The motorized stepper will advance 28 µm ±1 µm. The compact design of the Leica Rm2165 allows for use in any lab bench or workspace. Sectioning can be done either in a single or continuous stroke, or when operating manually with the handwheel or rocking mode. 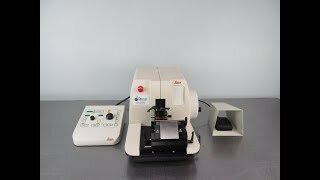 The rocking mode of this rotary microtome is particularly efficient and fast for small specimens. This microtome is operated from the control panel with digital display, including section and trimming thickness, sectioning speed, coarse and fine specimen advance, sectioning window size, and sectioning mode Additional accessories are sold and available from Leica Biosystems. This Leica RM2165 has been fully inspected and is performing to expectations. All of our lab equipment comes backed with our standard warranty. Should you have any questions, please don't hesitate to contact us.